Tis the Season…to Give Selflessly! Sometimes I feel like I’m the Grinch when the calendar turns to December. Don’t get me wrong, though. I love Christmas. I annoy my kids by playing carols at random times throughout the year and then almost non-stop once it’s “allowed” on December first. We have a real tree that my kids helped pick out and decorate. There are even several colorful strings of lights hanging from the front of our house thanks to yours truly. I grew up looking forward to Christmas because I knew that I would get to see my grandparents and cousins and extended family. I have fond memories of those Christmases long ago. For me, it was really the most wonderful time of the year! But the Grinchy feelings come from the pressure to buy buy buy that permeates society this time of year. I’m pretty sure I saw some Christmas decorations in stores in September. As a Stay At Home Dad I have extensive knowledge of the fact that we really don’t need another toy or whatever gadget or gizmo is hot this year. As our family has grown over our nearly 22 years of marriage, my wife and I have minimized the volume of gifts so that we could instead focus on the true sprit of the season: being selfless. In the past we’ve adopted families from a “giving tree” at our church or place of employment, filled a box for “Operation Shoebox”, sung carols at a nursing home, given a tree to a single mom who couldn’t afford one for her kids and so on. Hopefully the message of serving others was being backed up by our actions. For this reason I am excited to partner with Lee Jeans and Life of Dad, LLC for their Lee Good Deed campaign. In the pocket of the pair of Modern Series jeans that Lee sent me was a card that challenged me to “choose one of the three deeds…to better the day of a loved one, neighbor, or even a stranger.” Challenge accepted! In fact, I chose to accept two challenges for twice the experience. The first thing we did was partner with our church’s Holiday of Hope program that gives presents and grocery gift cards to needy members of the surrounding community. 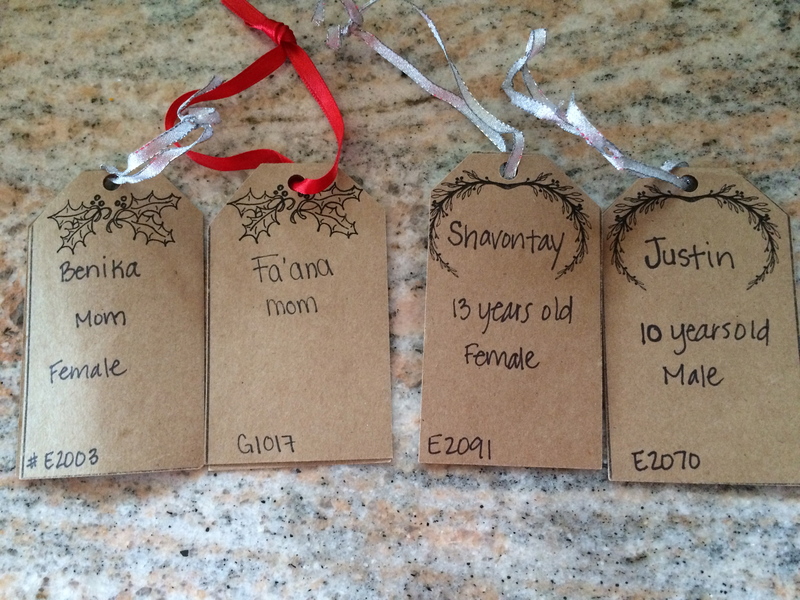 I selected four tags and brought my 13 year old along to the store to shop for the gifts. She was a great help in selecting meaningful items for each person. We had a good time together doing something nice for people that otherwise might not have much under the tree this Christmas. We brought the items to church last Sunday where they were wrapped by the congregation between services. The recipients will get the wrapped items this coming Saturday. The second challenge kind of fell in my lap when I found out that one of my friends (who had recently had surgery) needed some help with meals for his family this week since he’s unable to cook while he recovers. I enrolled the help of my three younger kids for this challenge. Rocking my stylish and comfy jeans (thanks to the Active Comfort Denim with 4-way flex) we zoomed through the grocery store to collect the ingredients for one of my kids’ favorite meals, shepherd’s pie. 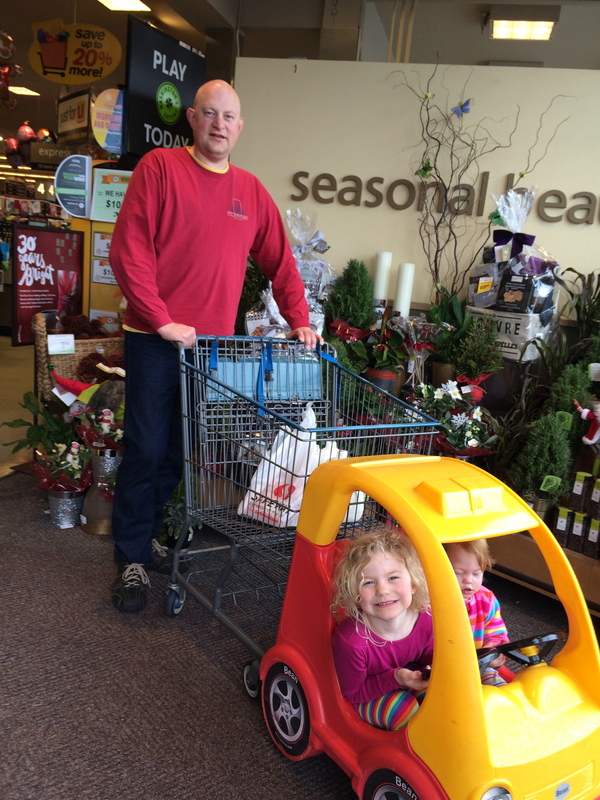 Despite the erratic driving of my 4 year old we made it through the store unscathed. Once home, my kids helped to chop the garlic, onions and bell peppers in the hand-cranked device. My four year old “helped” to open the package of meat by poking holes in it with her finger, which was subsequently washed. 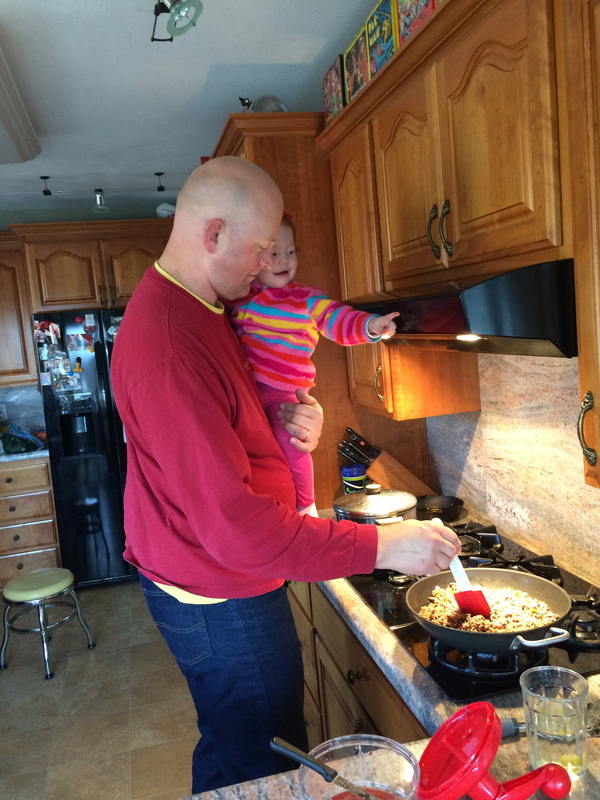 Not to be left out, my 18 month old wanted to be held while I cooked it all. 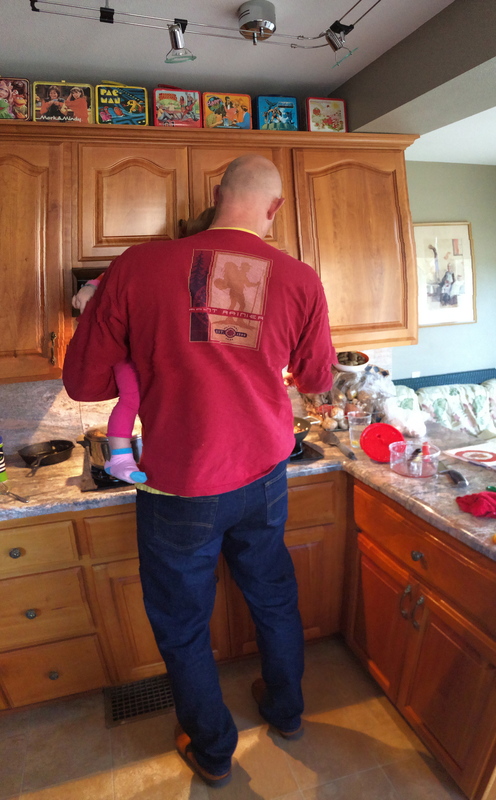 What you can’t see in the photos is that we were also dancing to some fantastic Christmas music while cooking together. Did I mention that the jeans withstood my old-man dancing moves because of that 4-way fit of the Active Comfort denim? Rocking around the kitchen with my toddler on my hip! The final “help” was that of beater-licker which was completed by the lovely toddler. Mashed potatoes were never so good. We then piled into the van to drive across town to deliver the meal to my friend. While he and I chatted for a couple of minutes my 4 year old made fast friends with his cat. A purrfect ending to the second challenge. So, what kind of #LeeGoodDeed challenge could you do this holiday season? It doesn’t have to be anything fancy or super involved like shopping or cooking like we did. Help out an elderly neighbor with a home repair, raking or shoveling. Volunteer at a local soup kitchen or food bank. Watch a friend’s kids so he/she can have a day off. But a cup of coffee and a value meal and give it to a homeless person. There are all kinds of ways to show some uncommon love and kindness to common people every single day. I’d love to hear your stories of doing good. As stated above, I have partnered with and was compensated by Life of Dad, LLC and Lee Jeans for this post, yet these words are my own. 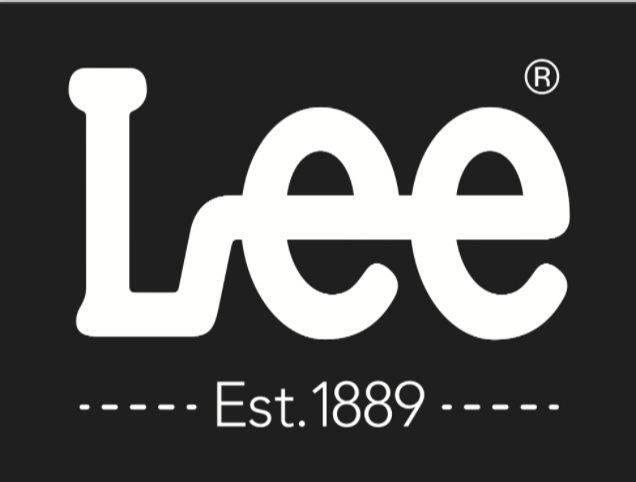 In case you didn’t know it, Lee Jeans has been on the forefront of jeans and denim wear for 125 years, having been founded in 1889 near Kansas City. You can find the latest looks from Lee Jeans at your local Kohl’s, JCPenney or Sears, or online at Lee.com. 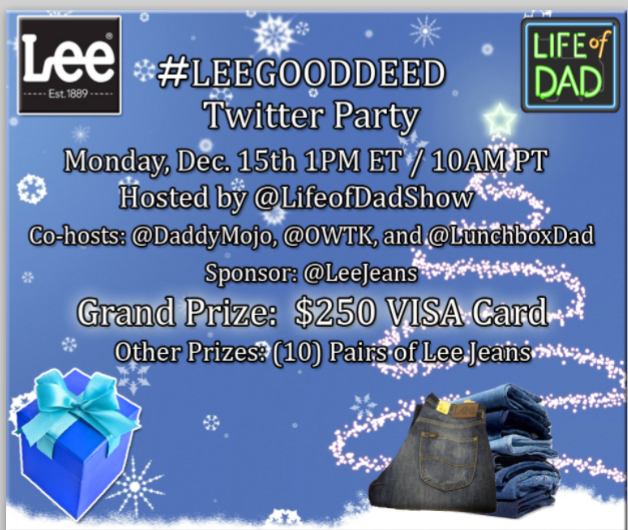 Check us out on Twitter this Monday, December 15th at 1 pm EST or 10 am (PST) for a #LeeGoodDeed Twitter Party. There are pretty cool prizes to be won.